RED RIVER is a classic 40s western featuring a rare John Wayne performance that's convincing as a rounded character as opposed to being true to his own star persona. Camus is surprised how itchy the trigger fingers are. "Hawks will work within a frame as much as possible, cutting only when a long take or an elaborate track might distract his audience from the issues in the foreground of the action. This is good, clean, direct, functional cinema, perhaps the most distinctly American cinema of all." In his seminal tome subtitled Directors and Directions (1929-1968), Sarris collectively called his chosen greats 'the pantheon', not as in 'the collection of gods' sense or the Roman building but a group of particularly celebrated people in their field. In the pantheon of American film directors, Howard Hawks rubs shoulders with the greats and so he should. One of the few filmmakers whose surname has been converted to an adjective (Hawksian joins Hitchcockian, Wellesian, and Kubrickian), Hawks developed and built upon a very personal output that dovetailed well with the tastes of his audience. He enjoyed great commercial success in his day. He was lucky enough to be working when the Hollywood machine was exactly attuned to his talent and ambition. Some of his movies are the finest old Hollywood has ever produced. Has there been a smarter, better and more dense (as in speed of dialogue) screwball comedy than His Girl Friday? How about a movie that tops Hawks' Rio Bravo for its mythic but playful stance on every western trope since movies began? Anyone want to argue with The Big Sleep as one of the finest examples of hardboiled detective noir? And one of my favourites, Only Angels Have Wings... Has there been a better model of machismo under pressure and what's required of men to endure loss? I get salty eyes just remembering the bandaged hands of once disgraced and now redeemed flier, MacPherson taking that well deserved drink. Hawks crossed genres like a pinball and every one he touched lit up, bells a-clanging. He could do it all and yet his technical style is about as unfussy as you'd wish for. Hawks has earned a lauded niche in Hollywood history as being the acceptable face of American machismo. Faced with a single phrase to sum up Hawks' work, it has to be 'A man's got to do what a man's got to do.' Hopelessly clichéd, I grant you but that does the job. 'Hawksian', an adjective used more often in describing women, imparts a worldly, 'mustn't grumble' sensibility, a tough-as-nails, laissez-faire attitude that folds in a certain personal integrity. Women in Hawks's pictures had to be the equal or at least the measure of the men. Some see this as an early feminist vanguard blossoming. I just see it as creating strong characters but the 'Hawks' Woman' has, in marketing parlance, been pretty sticky down the years. I remember director John Carpenter (a true Hawks aficionado) describing his then wife to be, Adrianne Barbeau, as a 'real Hawksian woman'... In Red River it's the females who speak the most sense and bend the men to their will. It's a shame we see so little of them. As evinced in my review of Birth Of A Nation, it's impossible to review accepted classics without a modern perspective elbowing its way to the front. I vividly remember seeing John Wayne on the Chisholm Trail as a boy, in the days when it was not only perfectly acceptable to draw your cap gun and shoot an 'Indian', hell, it was expected. They were the bad guys, right? It's fair to say that most of the characters in Red River need a year's supply of hand cream for those itchy trigger fingers. I was appalled at the number of disagreements settled with a bullet. Again and again, someone is gunned down for the silliest reason and it was, ironically for me, a wake up call. Attitudes have shifted, society has moved on. Even though set up for humour, the mourning of a nameless guard in the Austin Powers movies has real resonance now. Seeing Wayne kill the Mexican who'd ridden up to inform him that the land belonged to his master, all I could think about was the family he may have left behind. What was a man's life actually worth? But then as Kim Newman pointed out in his book Nightmare Movies, after four murders, the Texas Chainsaw family had barely broken any laws. In Texas, trespass at your peril. As a child, when I saw Wayne outdrawing the Mexican, I probably cheered. After all, the Mexican drew first... That excuse is not nearly enough of a reason to end someone's life today, not by a long way. Where's the wounding shot? Or the shooting the gun out of a hand shot? That's enough for 2013 but it did inform the whole experience of watching the movie. I find that aspect utterly fascinating. The movie's been stuck in amber but we have evolved beyond it. A Christian burial performed by the man who killed the deceased doesn't go one inch of the miles of redemption that particular 'sin' requires. But this was the lawless west and 2013 morality has to take a backseat. How much you can enjoy the drama by accepting these trivially delivered killings is up to you. I got used to it pretty swiftly but it did affect my viewing just a small but noticeable amount. The title page of a book, 'Early Tales of Texas' opens the movie with excerpts of the story in handwritten pages that are interspersed throughout the feature. According to the excellent accompanying booklet, there is a voiceover version doing the rounds that dispenses with the on screen pages. A wagon train rolls through the untamed west, California bound. 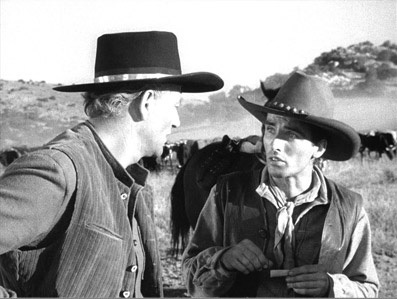 Thomas Dunson (Wayne) peels off with his two cows and a bull intending to start a cattle ranch in Texas with his older friend Groot (Walter Brennan). Bizarrely he leaves Fen, his sweetheart, behind and hours later, finds out that the wagon train has been ambushed by Indians. I would normally be sensitive to this acceptably maligned, generic word and replace it with 'Native Americans' but given Red River is a classic Hollywood western, it seems almost perverse not to say 'Indians'. The only survivor was a boy, Matt Garth (Micky Kuhn) who despite being in shock still shows himself to be a fighter and worthy of being adopted by Dunson and Groot. Fourteen years later and Dunson has his ten thousand strong herd but there is no market in the South, the losers of the Civil War so Dunson has to herd his cattle for at least three months up to Missouri... The Father figure and adopted son (now all grown up into Montgomery Clift) set off with a promised reckoning along the way... How I would love to have been a fly on the wall in between takes on this movie. There would be Hawks, a man's man if ever there was one (for heaven's sake, his middle name was 'Winchester' like the rifle); Wayne, as right wing and staunchly masculine as he appears and with an acting style he once said was simple reaction; and then there's Montgomery Clift, twenty-six, a method actor of a sort and an outspoken liberal. Let's not even touch upon how his homosexuality might have bothered Wayne. But professional attitudes prevailed and talking politics was off limits during the shoot but the tensions were there. It's said that Clift turned down the tailor made part of the alcoholic Dude in Rio Bravo so as not to suffer the company of Wayne and Brennan again. Just before the big push, the character of hired gun Cherry Valance (John Ireland) joins the crew. In a scene that begs for the appliance of sexual academic subtext, Ireland and Clift, six shooters in hand, compare their abilities. Their unerring skill with a weapon always makes for good cinema, something that never fails to remind me of the Sundance Kid's line after asking if he can move before showing how good he is with a gun... The target twitches and explodes as Redford swivels hips and flashes an arm. "I'm better when I move." Now if this playful gunplay isn't a set up for some serious young wippersnapping gun-slinging later on, I'm a Welshman. Alas, I am a Welshman. Hawks found Ireland's behaviour too obnoxious on set and directed him - and cut him - out of the picture. He has a role in the climax but any prospect of a Clift and Ireland dénouement was lost through an actor's boorish behaviour. Wayne is blunt with his crew and is something of the all-powerful anti-demagogue (ruling by unpopularity) on the trail and his selfishness and disregard for his men gets worse by the mile. This sets up tensions with his adopted son that culminates in the stay of a double execution. Clift and Wayne face off and Wayne makes a promise we just know he cannot keep... Or can he? Author Borden Chase's story ends very differently from Hawks's movie. There are small moments that showcase Hawks's command of detail, small moments that make you care more about the bigger picture. When Matt as a boy is asked to move back as the Mexicans face Wayne, there is a gorgeous shot of Wayne advancing filmed from inches above his eye-line and in the background, Micky Kuhn as Matt mirrors Wayne's patented swagger, left to right in perfect unison. This is a lovely character moment that says more about the two men than dialogue ever could. Later in the film, Joanne Dru surprises Clift in his hotel room and as he moves towards her, he brushes up against a lamp sending it swinging to and fro. The romantic mid-shot is played with both alternating light and shadow playing over their faces, sub-texturally visualising the dilemma that Clift faces. It's a facet of smart Hollywood that I appreciate over most other aspects, that directorial drive to fill the frame with touches only appreciated from hawk(s)-eyed multiple viewings. There are only two female roles in Red River. The first is Dunson's soon to be Indian-slayed wife-to-be, Fen (Colleen Gray). She has little screen time to convince Dunson to take her with him but masculine ethics compel him to see her as a weakness if attached to him. He says "It's too much for a woman..." Ouch. She makes the mistake of telling him that he's wrong and Dunson, offended, turns his heel and is gone. I'm afraid I would have taken her with me. She reminds him, half the day is night (what a subtle way to advertise her warmth and sexuality). That's great screenwriting. The principal female role in the movie is the only character that seems to be making any sense beyond the laconic 'Man's-gotta-do-World'. 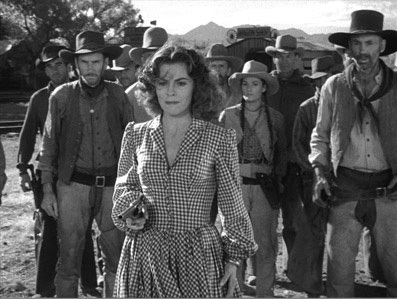 Played by Joanne Dru, Tess Millay is rescued by Wayne's men led by Clift after being surrounded by Indians. They really are your all-purpose disposable bad guys, aren't they? At least Nazi ciphers could shoot back with guns and not wooden sticks. Dru and Clift share a moment and her Hawksian credentials are secured when she takes an arrow in the shoulder and barely smarts. She even finishes her sentence! It's a terrific effect. Even frame-by-frame analysis can't reveal how the arrow was delivered. Maybe Hawks had an arrow fired at her. Dru is central to the protagonists' maturity. She gets her moment in the sun with both Wayne and Clift and drills down to the emotional core of the two men. She knows that death is the only destination if they stay on their set paths. Many have criticised the ending as being too pat (I'll give nothing away) but for all the cattle driving drama on offer, it is the one scene I remembered most after seeing it as a child. But when it comes to pure cinematic spectacle, Red River delivers the goods in spades. There is no Massive software computer generating the cattle. These animals are right there and stuntmen or not, there are men riding around and through them. This is a job that must have suited Hawks and Wayne's masculine worldview to a tee. I can't imagine many things more terrifying. 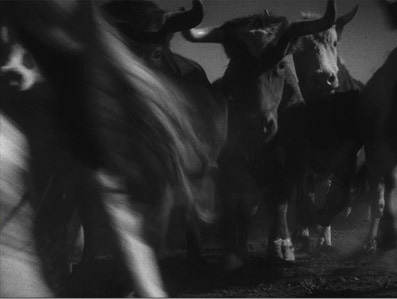 Of course, you can't have a cattle drive movie without a stampede and the event itself is thrilling and scary and vividly urgent. Because you know that these are real animals running full pelt and real men riding horses trying to stop them, a level of realism is attained that kicks any suspension of belief off the table. You don't need to suspend your belief – you're seeing it. The only downside is the cutting to studio-bound back projection work but with Dimitri Tiomkin's fine if Western-standard score belting out, you're in for a "Yee ha!" treat. Welcome to classic American cinema. Presented in its original 1.37:1 aspect ratio, the movie has scrubbed up quite well. Grain is evident throughout and the black levels are good and consistently solid. Contrast is also, surprisingly, consistent with many of the night scenes retaining detail in the shadows while not 'greying out'. I was ever so slightly disappointed, after viewing many more successful restorations of older movies, at the amount of dust and negative damage in evidence. The entire movie seems never entirely free from dirt with intermittent thin white tramlines being the most obvious. And seen from a modern audience's perspective, it's always clear when we're watching studio bound shots with backdrops projected in, one of the very few drawbacks of high definition. There are subtitles for the hard of hearing. The LPCM 1.0 mono soundtrack is perfectly clear with very little analogue hiss belying its age. A 7.1 or 5.1 remix would certainly beef up the drama during the stampede (sorry) but on the whole, both picture and sound quality are very good given the age of the material. This was listed in many sources as an Extra but unless it's an Easter Egg, I couldn't find it. To be fair, it's been omitted from Eureka's official Red River web page but it's listed almost everywhere else. I'm sure it's a very good trailer but you won't find it here. This is a Radio Theatre production of the movie with Wayne heading the cast. Unsurprisingly Montgomery Clift is not in evidence. Jeff Chandler takes his place. I'm always wryly amused by American commercialism in the 40s and this one's hilarious (Lux being the soap of course, hence 'soap operas'). Narrated mostly by Walter Brennan, this one is for completists. The post recording chat has the distinct impression of being laboriously scripted (alas, not well scripted either) but it's all of historical interest. Again, I'd love to hear from those who play this Extra and gather some entertainment value from it. It's an M&E folks! It's simply a functional delivery requirement when shipping to overseas markets. Granted, to those not in the business it may seem like an exotic extra but it really isn't. What is extraordinary is the fact this track is still available. The usual "How to view this movie..." and Credits. Another classy entry from MoC: For my money the bitching between original author Borden Chase and Hawks's subsequent response is pure film myth gold. It is extraordinary how success and time can distort recollection. I'm not saying I believe either Chase or Hawks absolutely on any of the debatable points but one is apt to trust the director's memory more than those who were not there or there infrequently. Christian Nyby's interview is also a highlight. He expounds on the editing (or re-editing of the movie) and his account shows how important a good editor is to a harried director. Hawks had nine cameras running on some of the stampede scenes and it seemed the original editors simply did not take the time to mine the gold in the rushes. Trust me, I know what it's like to walk into a room on a project with a shooting ratio of 100:1 and this is more common now due to the fact that 35mm film stock is diminishing in usage. Filmmakers seem less concerned with shooting hundreds of hours because of its 'cheaper' digital nature. Author Douglas Coupland used the following term to describe something comparable; option paralysis. I've had my fair share of this condition. This booklet is considerably longer than any of the others I've reviewed and that's a good thing. It's a terrific source of relevant information on the movie. This is a solid entry in Eureka's Masters Of Cinema strand. 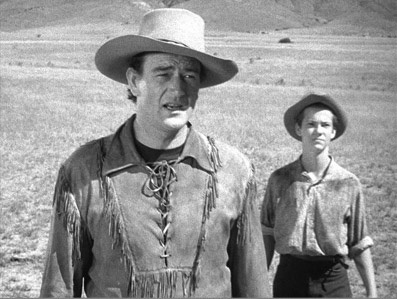 Red River was released in 1948 after a two-year delay over legal issues with Howard Hughes claiming too many similarities with his movie The Outlaw. Given its advanced years, it looks good save a few inevitable tramlines and dust spots. The story is still a cracker as long as you can accept the lawlessness and Wayne never gave a better performance in a career as a cinematic icon, the personification of America on screen. It was Clift's first movie role (though the delay of the movie's release meant audiences saw him first in The Search for which he was nominated for an Oscar). His extraordinary acting style and physical nature set him at the extreme opposite end of Wayne and co. but this works only too well for the drama. If you like your westerns classic, then this is one of the best and handsomely mounted – well recommended.